(Nanowerk News) Nanoscale materials feature extraordinary, billionth-of-a-meter qualities that transform everything from energy generation to data storage. But while a nanostructured solar cell may be fantastically efficient, that precision is notoriously difficult to achieve on industrial scales. The solution may be self-assembly, or training molecules to stitch themselves together into high-performing configurations. Now, scientists at the U.S. Department of Energy’s Brookhaven National Laboratory have developed a laser-based technique to execute nanoscale self-assembly with unprecedented ease and efficiency. Yager and Brookhaven Lab postdoctoral researcher Pawel Majewski built a one-of-a-kind machine that sweeps a focused laser-line across a sample to generate intense and instantaneous spikes in temperature. This new technique, called Laser Zone Annealing (LZA), drives self-assembly at rates more than 1,000 times faster than traditional industrial ovens. The results are described in the journal ACS Nano ("Millisecond Ordering of Block Copolymer Films via Photothermal Gradients"). 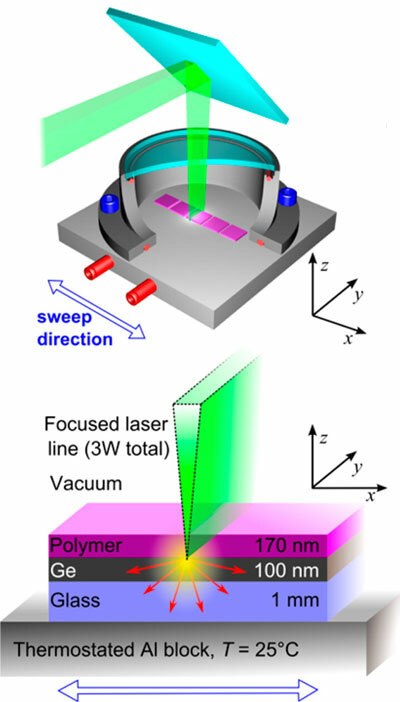 Illustration of the Lazer Zone Annealing instrument showing the precise laser (green) striking the un-assembled polymer (purple). The extreme thermal gradients produced by the laser sweeping across the sample cause rapid and pristine self-assembly. The scientists prepared the materials and built the LZA instrument at the CFN. They then analyzed samples using advanced electron microscopy at CFN and x-ray scattering at Brookhaven’s now-retired National Synchrotron Light Source (NSLS)—both DOE Office of Science User Facilities. “It was enormously gratifying to see that our predictions were accurate—the enormous thermal gradients led to a correspondingly enormous acceleration!” Yager said. Imagine preparing a complex cake, but instead of baking it in the oven, a barrage of lasers heats it to perfection in an instant. Beyond that, the right cooking conditions will make the ingredients mix themselves into a picture-perfect dish. This nanoscale recipe achieves something equally extraordinary and much more impactful. The researchers focused on so-called block copolymers, molecules containing two linked blocks with different chemical structures and properties. These blocks tend to repel each other, which can drive the spontaneous formation of complex and rigid nanoscale structures. In traditional block copolymer self-assembly, materials are heated in a vacuum-sealed oven. The sample is typically “baked” for a period of 24 hours or longer to provide enough kinetic energy for the molecules to snap into place—much too long for commercial viability. The long exposure to high heat also causes inevitable thermal degradation, leaving cracks and imperfections throughout the sample. The LZA process, however, offers sharp spikes of heat to rapidly excite the polymers without the sustained energy that damages the material. LZA generates temperatures greater than 500 degrees Celsius, but the thermal gradients—temperature variations tied to direction and location in a material—can reach more than 4,000 degrees per millimeter. While scientists know that higher temperatures can accelerate self-assembly, this is the first proof of dramatic enhancement by extreme gradients. The researchers needed a high concentration of technical expertise and world-class facilities to move the LZA from proposal to execution. The scientists also developed a new microscale surface thermometry technique called melt-mark analysis to track the exact heat generated by the laser pulses and tune the instrument accordingly. The LZA is the first machine of its kind in the world, but it signals a dramatic step forward in scaling up meticulously designed nanotechnology. The laser can even be used to “draw” structures across the surface, meaning the nanostructures can assemble in well-defined patterns. This unparalleled synthesis control opens the door to complex applications, including electronics. The scientists plan to further develop the new technique to create multi-layer structures that could have immediate impacts on anti-reflective coatings, improved solar cells, and advanced electronics.